Once you've configured your drivers, go to Settings > Vehicles to create and configure vehicles. Individually, clicking on New Vehicle. With batch vehicle creation. 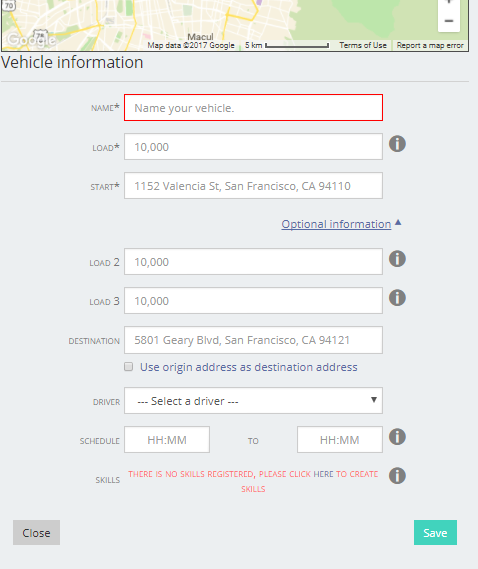 To do this, click on Download list, download and fill out the spreadsheet with vehicle information, and upload it using Import vehicles > New Vehicles. Title: This will be the name used for this vehicle. You can use the licence plate number or an easy-to-remember name. This can be edited later. Capacity: This is the maximum amount of product the vehicle can carry. You may use whichever unit is best suited to your needs, whether it's maximum load in tons, maximum volume in cubic meters, etc. If you're unsure of the particular vehicle's capacity, you can use a dummy vale and later change it to the correct value. Origin: The starting addresses for visits using this vehicle. This can be the address of your warehouse or your home address. IMPORTANT: When filling out the address, make sure to choose the correct address from the suggested addresses so that your vehicle has an exact location on the map.